I’ve noticed Zoomii from the time Chris Thiessen did his presentation on Democamp 14. It was so impress and inspiration! 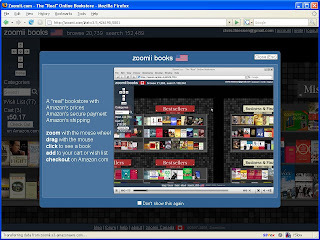 As Chris said, “Zoomii” is the closest the one which gives you the shopping experience like a real bookstore. Which I think is true. Take a minute on watching the video he created, I believe you will agree with me too. Chris has built this from zero. By zero, I mean he even built the web server for this instead of using Tomcat or others. I’ve asked him why, he said it was not that hard to create a web server and he only implemented what he really want, so the performance is pretty good. Anyway, Zoomii is pre-open now, give it a try and you will like it. We all love TextMate, by all means. It is the best friend for Ruby Developers. This is an awesome lovely command in Ruby Bundle, absolutely my favorite! It allows you to run a single unit test out of a whole suite of tests by simply positioning your cursor into the test you’d like to run. This is another cool command too. It shows a popup window which list all the available rake tasks you have and it will show a pretty HTML result window after you choose from the list. This thing really bothers me a lot. I could be fine for the second one, as I do have terminal windows open all the time. But I really really miss the first one, as our test files get longer very soon. I have to make it work! After couple of hours trying today, I’ve pretty much got the right reason and the simple solution, for now. The reason is that TextMate includes its own version of builder.rb, which is conflicting with Rails 2.0′ version of builder.rb. That’s it! And apply the same changing method to other commands such as “Run Rake Task” as well. It’s up to you to choose one of them. Hope Google can pickup this post quickly so we can save somebody else sometime too. This the second one of My Mac Serial posts. The first one is about Color Pickers. WikiPedia: A Menu extra, menu item, menulet, or status item in Mac OS X is a small icon or sometimes a word that appears at the right of the menu bar. They often provide quick ways to use applications (e.g. iChat) or display information (for example the system clock), or control system-level variables (for example the volume control). There are a number of third party menu items available. Menu extras are similar to items in the Microsoft Windows system tray but are less common. This is the current Menu bar I have. A little too long, yeah, I know. The resolution of my main screen is 1680×1050, so most of the time it is still OK for me to have such a mass Menu bar. Spotlight in Leopard can search through your files on your network. Spotlight window is same as Finder window, so you will have coverflow and quicklook too. Built-in bluetooth menu item from Apple. Nothing special. I keep it just because sometime I have to turn bluetooth off and on again to find my MS Presenter mouse 8000. Built-in input source menu item from Apple. Nothing special either. I need it so I will know what kind of input method before I am typing. These three are all iStat Menus from iSlayer.com. It helps me to monitor my lovely MacBook at all the time, so I could know what’s going on in my system and make sure be cooler. The color? Yes, it is pink. Looks pretty, right? Simple and straight updates you about the weather of the multiple locations you want to know. If you are in USA, you will have a Radar view too, even better. SwitchResX from (Miss?) Stéphane Madrau. It is extremely helpful if you use extra monitors and you change your locations often. It provides a lot short cuts on the menu, so you easily switch your main display, change resolutions, turn on/off Video Mirroring when you do presentation, save icons position of your desktop, detect displays if nothing happen after you plugin extra monitors and even more. Another very neat feature is it is very easy to change the rotation of your monitor. Of cause you need a monitor which supports this. So I can always turn my monitor from horizontal to vertical when I am reading blogs. Now a day blog posts are getting longer and longer. Such as the one you are reading now. Built-in AirPort from Apple and WiFind from TastyApps.com. AirPort menu has little improvement in Leopard. It becomes much useful after you install WiFind. WiFind can tell you the signal strength of every wifi network you can reach, and are they open or not. WiFind supports Tiger too, and it integrates even better with AirPort Menu. In Tiger, you will only have one networks list instead of one list plus a submenu list too. It keeps me always uptodate on my mac applications. It is quite essential for somebody like me as an appaholic. As you can see in the screenshot, it will kindly show the application icons if you already have the application installed. Freeze Frame from Elgebar Studios. Freeze Frame allows you to completely freeze an application, making it use absolutely no CPU cycles. I keep my applications always open at all the time. At some point I will have severial web pages open with flash in them, it will become annoying as they take a lot of your cpu time. So I can simply freeze my Firefox or Safari when I am doing other things. Jumpcut is a opensource application. It is hosted at sourceforge right now. Jumpcut was original created by Mr. Steve Cook from snarkout.org. It is very simple but powerful enough. It provides quick, natural, intuitive access to your clipboard’s history. You can paste from your previous copy by just one click. TextExpander saves you countless keystrokes with customized abbreviations for your frequently-used text strings and images. For example, instead of input “February 2, 2008″ you just type “ddate”,TextExpander will automatic change “ddate” to “February 2, 2008″. Yes, it just did it for me again. I really love their tagline for it, “If yor’re not using it, you are wasting time”. And I can tell you, it is true. I am using it to track how much time I spend on every projects, applications and websites. It has a very beautiful timeline interface. It even has some AppliScript APIs, so you can put it into your workflow then every time you open an application it will switch your tracking project too. Wallpaper Clock from Jacob Bandes-Storch. It shows clock as part of your wallpaper in the most artistic way. VladStudio has more than 100 wallpaper clocks which you can choose from. You can even use them on windows too, by using Chameleon Clock from Softshape. Wallpaper Clock handles one of my screen and another screen is handled by the next one. Desktoptopia is a desktop background manager for the mac that automatically loads and displays designer desktops on your monitor, as often as you wish. desktoptopia.com currenly had more than 200 wallpapers you can use, everyone of them are very high quality and gorgeous. And you can even submit your own. We all have built-in sound volume control from Apple. But if you have more than one input devices or output devices, PTHVolume make it so much easier to switch between them. No need to say anything. Everybody on mac is using it. Adium is a free instant messaging application for Mac OS X that can connect to AIM, MSN, Jabber, Yahoo, and more. Well, finally. Last but absolute not least. Skitch from plasq. That’s it. Wow. Hope you can find something new here. Britta Gustafson manages a extensive of Menu Items list on http://menu.jeweledplatypus.org/ and a faq page on http://menu.jeweledplatypus.org/meta/. The last updated time for that was 6/16/07, so it is out of date but still pretty complete. Then I found an interesting post about Color Pickers was just coming from TUAW.com today. So I “grab” it to here. Title is a little confuse. But the content is very valuable and make sure check what people said in comments. Anyway, I’m not a graphic designer, I couldn’t give any professional opinions. So I just list some of them which I’ve tried and kept. Painter’s Picker puts an interactive color wheel in almost every Mac OS X application. It adds the ability to choose related colors, such as complementary colors, analogous colors, etc. directly within the color picker. It also adds more precise controls for choosing saturation, hue angle, and brightness. Painter’s Picker is the simplest way to perform complex color selection in almost any Mac OS X application. The Shades Color Picker adds an additional pane to the standard Apple Color Picker. It is designed to help you choose colors by showing you grids of related colors. Shades uses Hue – Saturation – Brightness (HSB) color coordinates which many people find more intuitive than Red – Green – Blue (RGB) color coordinates. To use Shades, you choose a center color, a step size and a color coordinate (one of H, S or B) to hold constant. Shades then draws a grid of related colors. RCWebColorPicker is a simple color picker for Mac OS X 10.0 or higher that displays the red, green, and blue values in HTML-friendly hexadecimal values. It also allows a user to restrict the sliders to only allow the 216 web-safe colors. Color Picker Pro, this is a stand alone application, it’s not a color picker. Color Picker Pro is a small drag and drop savvy application that aids in capturing hex, RGB and HSL color values for use in CSS and HTML production. Pull colors out of application windows, icons, your desktop or anything else that you happen to see on your display. Copy or drag and drop color values to your favorite text based CSS or HTML editing application. Store your frequently used colors, undo and redo color changes or make your colors web-safe at the press of a button. Tailor the format of your hex, RGB or HSL color values to your personal specifications. Tangerine, it is a color management tool. Tangerine color management software provides graphic designers and creative professionals with a unique color workflow experience. Now you can have the color you want, when you want it, how you want it. Tangerine offers new and enhanced color support to OS X.
ColorSchemer Studio is a professional color matching application for anyone from hobbyists to advanced professionals. Work with a dynamic visual color wheel, instantly explore harmony relationships and even let ColorSchemer Studio intelligently suggest color schemes for you!